Sekolah Bahasa Inggris – Kita bisa berpikir tentang kata-kata W-ever secara arti sebagai ‘ W’ word+ quantifier ‘any. Trik untuk memahami istilah-istilah ini adalah dengan menyadari bahwa mereka berlaku untuk setiap satu dari referen, dan pada saat yang sama mengacu pada semua acuan. We can think about the W-ever words semantically as the ‘W’ word + the quantifier ‘any’. The trick to understanding these terms is to realise that they apply to any single one of the referents, and at the same time refer to all of the referents. 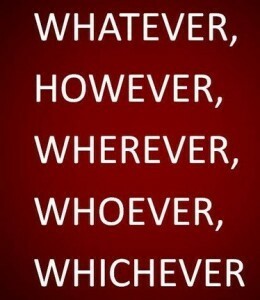 Wherever – Any ‘where’ (Ini juga bisa disebut Anywhere or everywhere). 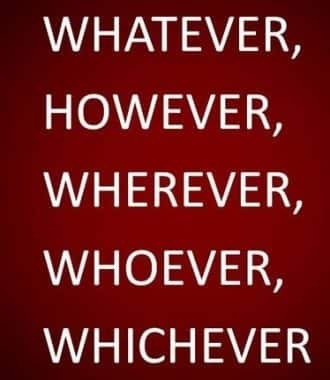 Whichever – Any ‘which’ (Pilihan antara sebuah kelompok). However – Any ‘way’ (Dalam banyak cara atau, bagaimanapun dalam bentuk how). Whatever you do, you have to remember your goal. People say you can do whatever you want in las Vegas, as long as you have the money. Dedi was so intelligent that whatever i taught, he understood. Whenever you need a help. I will always be there for you. Whenever Our teacher calls, we always feel nervous. You can call me whenever you need something. Whenever I go to sleep early, I always get up late. Wherever you go in this place, you will find something like this. With a good knowledge in English, wherever you go, you will get ease. Wherever we stay on, we have to keep the rule. Whoever broke my toys, could you please replace it? Whoever attends at this party, please don’t make a riots. You can do however you like for this party, it’s free. However much he eats, he never puts on weight. However rich they may be, it still isn’t enough for them.